This is Part 1 of a 3 part series on the Olympic National Park on Washington's Olympic Peninsula. 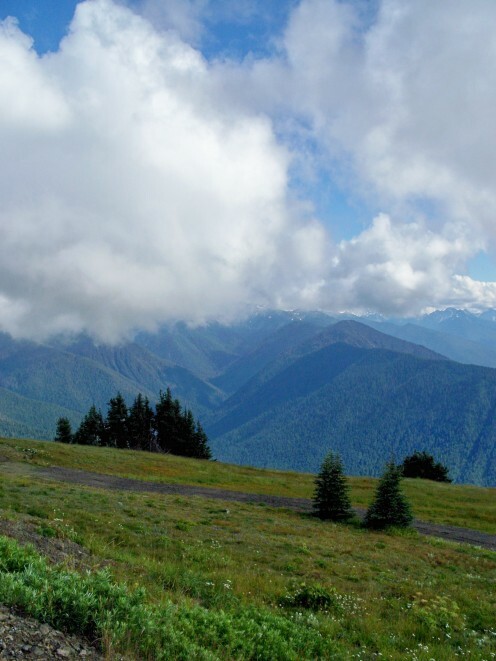 Hurricane Ridge, in the Olympic Mountainous region of the Olympic National Park, is one of the most beautiful spots on Washington's Olympic Peninsula. 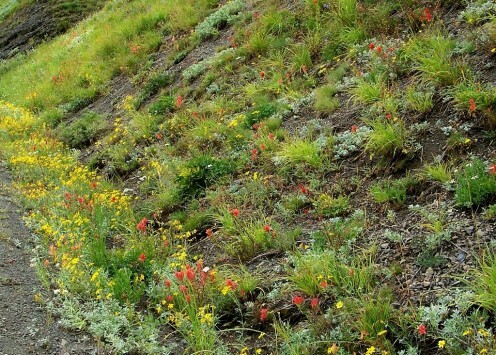 The roadside are lined with spectacular wildflowers and the meadows at the top of the ridge has beautiful displays in spring and summer. Along the scenic drive there are fantastic views of the Strait of Juan de Fuca and snow capped Olympic Mountains. 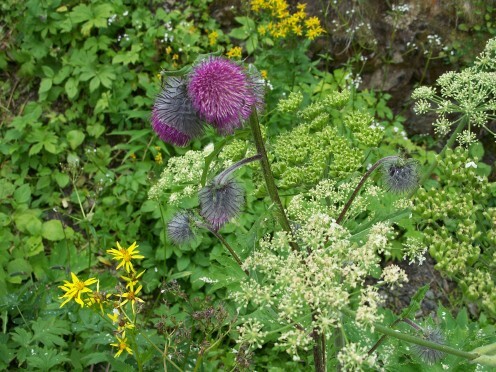 Our visit at the end of August coincided with not only beautiful weather, but a profusion of wildflowers in bloom which I photographed endlessly. Below I've shared some of my pictures, but you'll want to take many of your own photographs when you visit! 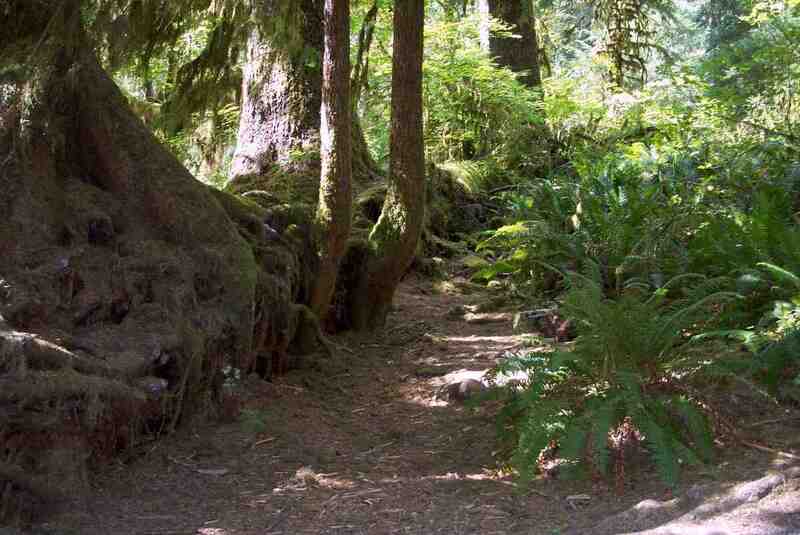 Olympic National Park is located on the Olympic Peninsula in the Northwest corner of Washington. 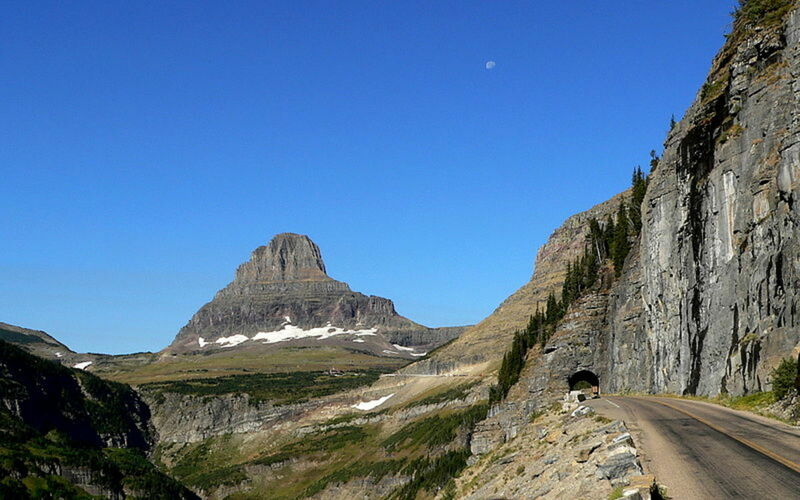 The park is open all year long, though some roads and campgrounds may be closed in winter. 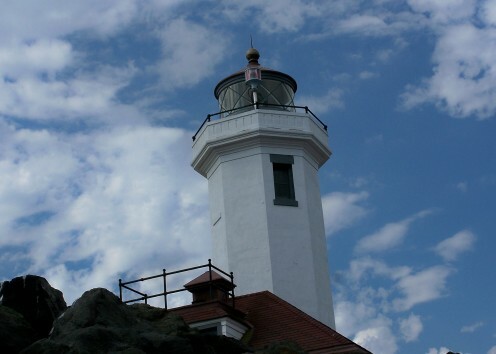 A good place to start your visit is at the Park's Visitor Center in Port Angeles. There you can get a good overview of the park as well as maps and information on driving, hiking and camping in the park. They can also give you information on areas that may be closed because of road construction or bad weather. 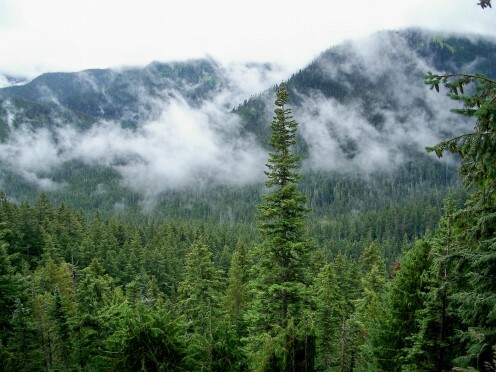 Olympic National Park is host to several different ecosystems: Mountains with Alpine and Sub alpine climates; Forest; Rain forest; Rivers and Lakes; Coastal. These ecosystems are found in the three distinct regions of the park: the mountains, the rain forest and the coast.Because each region is an adventure of it's own, I've focused on each one separately. In this article, I focus on Hurricane Ridge which has the most dramatic and easily accessible views. If you are are lucky enough to drive to the top of the ridge when the weather is clear, you will have amazing views of the Olympic Mountains. On a clear day you can see across the the Strait of Juan de Fuca to Canada's Vancouver Island. It's truly a "top of the world" view. Do check in at the Visitor Center on the day of your trip to the top of the mountain as they can tell you what the weather conditions and visibility are for the day. 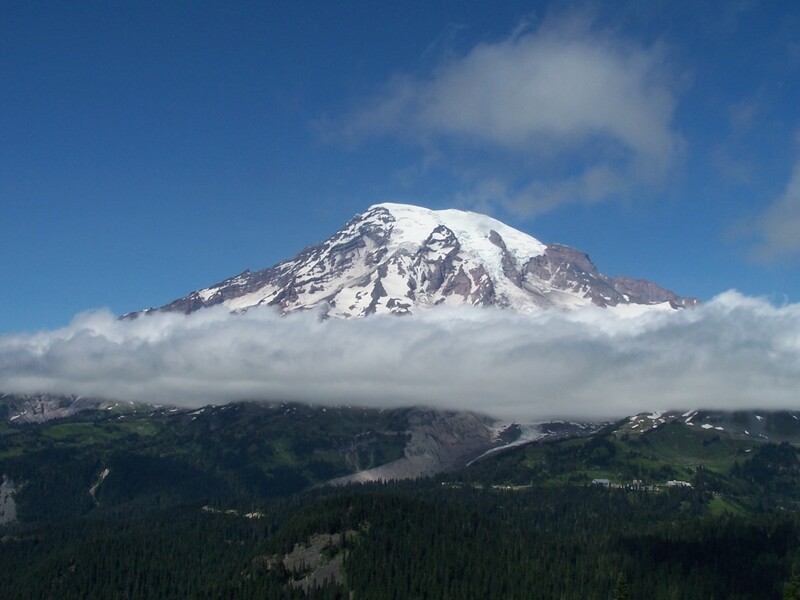 Clouds and fog can make driving treacherous and obscure the mountain views. It's much better to wait a day for good weather if you can. We started our visit at Port Angeles at the foot of the Olympic Mountains and drove 17 miles up the steep, winding road to Hurricane Ridge. 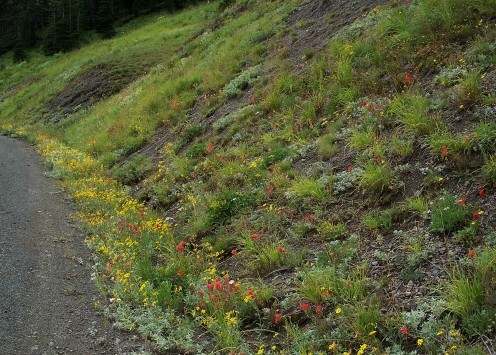 How lucky we were to arrive in late August when wildflowers covered the hillsides and lined the roadways! 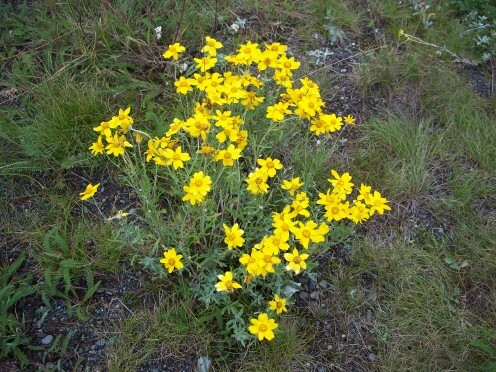 There are many pull-offs along the road where photography buffs can get one more shot of the views across the Strait of Juan de Fuca or close-ups of the wildflowers flowers. That's probably one reason why it took us two hours to reach the Visitor's center at the top of Hurricane Ridge! 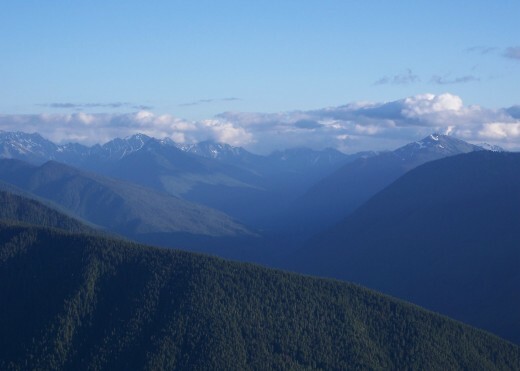 The Hurricane Ridge visitor center is at an elevation of almost a mile high. From the parking lot, there are trails which climb through alpine meadows that gives wonderful views of the surrounding Olympic Mountain Range. There are Ranger led walks, or you can take a leisurely stroll on the paved or gravel walkways. Hikers will find many trails to test their skills. Even in August, there are some spots of snow on the distant mountain tops. The day we drove to the top of the mountain was sunny and clear, but as we gained altitude, clouds and mist moved about the mountain peaks. It was a wonderful opportunity to take some really interesting photographs and gave us the feeling of standing among the clouds and looking down on the mountains. 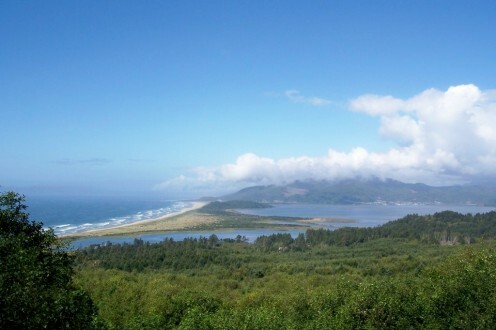 We sat on the terrace of the visitor center to enjoy the view, then headed onto the dirt road that led higher up the mountain to Obstruction Point. There we found picnic tables tucked in among the trees or perched on the edges of the banks. A deer came out to watch us as we ate our picnic lunch there. Despite dire warnings about the frequent rains and cloud cover in Washington, the weather was perfect for the entire month of our visit. The Olympic Mountains shelter the valleys of the Olympic Peninsula causing a rain shadow effect which protect it from excessive rain. 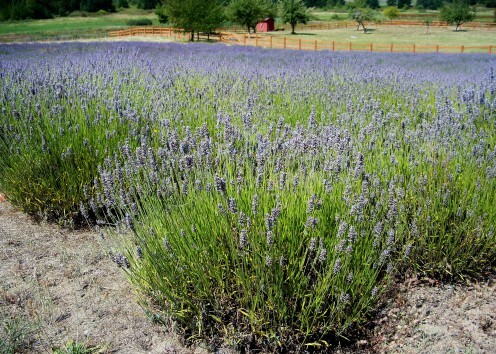 The town of Sequim, boasting some of the best weather in Washington, is known for its lavender farms. 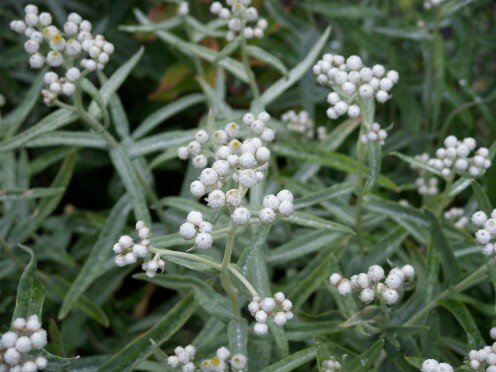 It was delightful to see pots and gardens blooming with the fragrant herb. We even visited some of the lavender farms in the area. 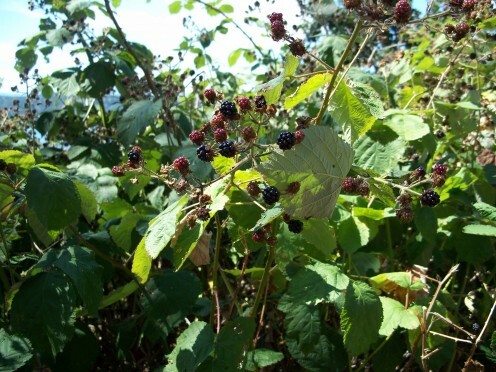 In August, blackberries were ripe everywhere. Although it's not wise to pick berries along roadsides because of possible pesticide use, we did find some out-of-the way places that were loaded with berries and enjoyed them immensely. 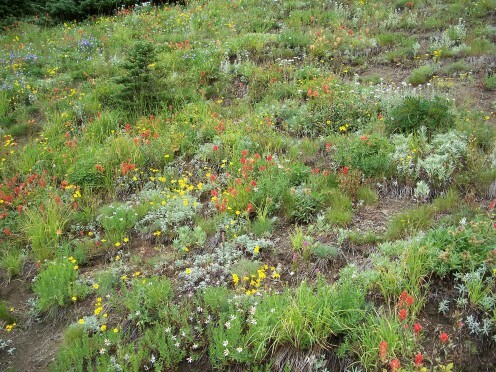 The wildflowers were in full bloom along the roadsides and were spectacular in park's alpine meadows. If you are a camper, you may decide to camp in one of the park's lovely campgrounds. Olympic National Park has 16 campgrounds with a total of 892 campsites. Eleven of those campgrounds have RV sites, those some have length restrictions. The park is open all year, but some of the roads and campgrounds are closed in the winter. If you plan a winter visit, call ahead for information. Kolalach campground will take reservations, but all others are available on a first come, first served basis. Each campsite generally has a fire pit and picnic table. There are no sites with electric or water hookups, though there is usually water available in each campground. There are no showers or laundry facilities. Although you can't usually reserve a campsite, you can call ahead to check on campsite availability. If you are driving an RV, call ahead to check on size restrictions as there are a few campgrounds where you can only bring in rigs less than 21 feet. Campground fees range from $12-$18 a night. America the Beautiful Senior passes are honored for a 50% discount. Washington's Olympic peninsula is a diverse and exceptionally beautiful place to explore and to get in touch with nature, and the Olympic National Park is a great place to start. If you have the opportunity to visit, be sure to take full advantage of all that the park has to offer. Tina Truelove - Hurricane Ridge n the Olympic National Park is one of my favorite places. I'm so happy to share some of its beauty with others and glad that you enjoyed my photographs. Thank you for visiting my hub! What a beautiful place! I'm so glad you were able to capture these photographs to share with others. Tillsontitan - So glad you enjoyed my hub and photographs of Olympic National Park. It is a very beautiful place...hope to go back someday for another visit! Thanks so much for your comments! Thank you for this lovely introduction to Olympic National Park. As always your photos are superlative and the hub was fun to read. I can see why it would be a favorite place! Prasetio30 - I'm so glad you enjoyed this article and the photographs of the Olympic National park and the Washington coast. This is one of my very favorite places, and it's always a pleasure when readers enjoy it with me. Thanks so much for your comments and votes! 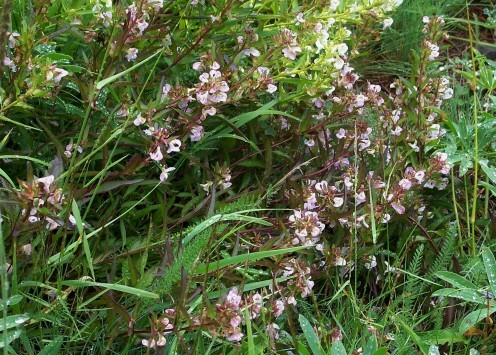 Hi Peggy, I'm sorry, too, that you weren't able to drive up to Hurricane Ridge when you were there. It was one of the most beautiful places that we've seen in the National Park system. I hope you get to do the drive on your next visit! :) Thanks so much for your comments and shares, and thank for linking to your wonderful new hub on Washington's National Parks! Beautiful and I really enjoy reading this hub. I love the pictures as well. I hope I can go there one day. Thanks for writing and share with us. Voted up! Rebeccamealey - I like to look back at my photographs of Olympic National Park often as it was one of the most beautiful places we've visited. I'm glad you enjoyed the article and photos. Thanks so much for commenting! Wow, what fantastic looking places to visit and record. Lucky you! Shared for sure are these awesome accounts and photos! After seeing your photos, I am sorrier than ever that the fog and clouds obscured our views and prevented us from driving up Hurricane Ridge to the top. Oh well...perhaps if we ever return the weather will be more cooperative. 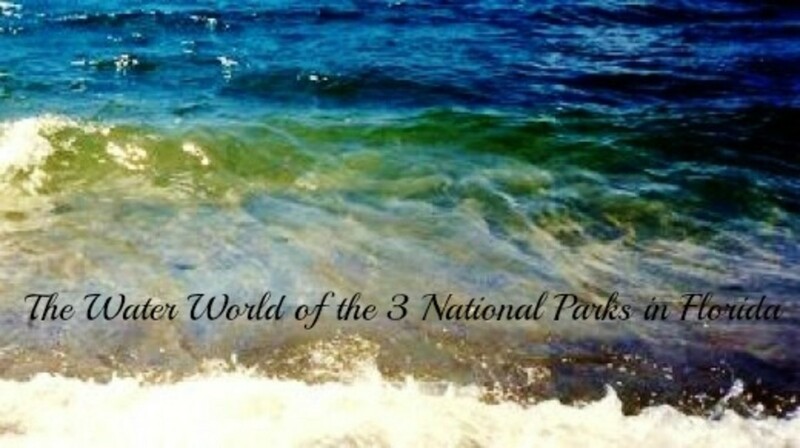 Linked this great hub to my latest one also about the 3 national parks in Washington. You have quite a few from this part of the world. Up, beautiful and interesting votes. Will also share. Thank you, Jools! Our visit to Olympic National Park and Hurricane Ridge was timed perfectly to see the roadsides up the mountain covered with wildflowers. It was delightful and unexpected - the perfect photo opportunity. I'm so glad you enjoyed your virtual visit - thanks so much for your comments! Gorgeous hub Stephanie; the mountain shots show the grandeur of the park but my favourite was the blanket of wildflowers; they are so small but perfect - eye catching and beautiful. Great photos. 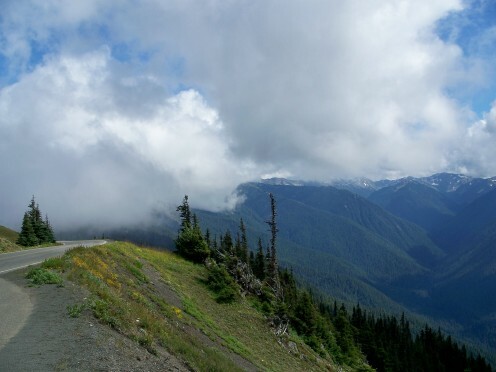 bdegiulio - I'm glad that my article and photographs brought back some good memories of your visit to Hurricane Ridge and Olympic National Park. It was certainly one of the most beautiful places we've seen, and I also remember the deer wandering through the picnic areas and parking areas. Thanks so much for stopping by to read and comment. Hi Steph. Hurricane Ridge is one of my favorite spots. I'll never forget the herd of deer milling around in the parking lot as we drove in. Your photos brought back some great memories. Great job. 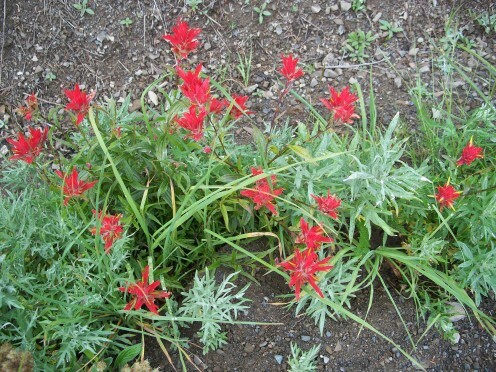 Daisy Mariposa - I'm glad you enjoyed my article and photographs on Hurricane Ridge and the Olympic National Park. I think that the park is one of the most beautiful and diverse in the National Park System. Thanks so much for your visit and comments. I enjoyed reading this article and viewing your fabulous photographs. Thanks for including so much helpful information in your Hub. Thanks so much for visiting my hubs, Steph! I can't tell you how much we loved the Pacific Northwest and how much we look forward to visiting again. Amazingly beautiful!! I was born and raised in Washington State and this hub captures so much of the natural beauty of the Pacific Northwest. Rated up and beautiful! How nice to hear from you Happyboomernurse! The Olympic Peninsula is one of my very favorite places. Just sorting through the pictures make me want to revisit the area. So glad you enjoyed it. Wow! You got some really amazing photos from the mountain top. And the wildflowers, especially the carpet of lavender were beatiful. This was another excellent travel hub full of practical information. Thanks so much for sharing.